Are you new in France? Have you planned on spending a lifetime there? If yes, then this post could be for you. France happens to be one of the most beautiful countries in the world. It is gorgeous, has an amazing nightlife and brilliant job opportunities for people who want to work. If you want good work, you’ll have to be a little patient. 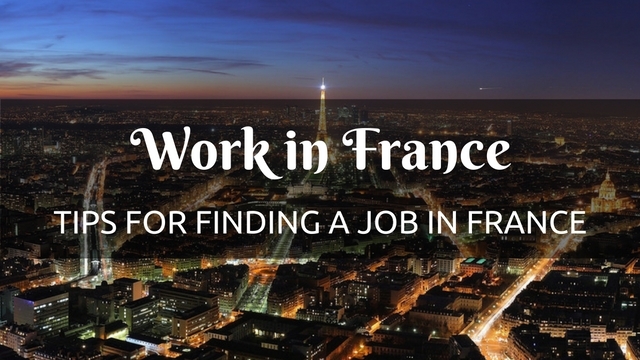 So if you are searching for a job in France, then this post will definitely help you. In this article, we have enlisted some of the best tips you can try and use for living and working in France. It might not be easy but it will surely become easier if you give this a shot. In order to get yourself a job in France, you need to learn the French language. Most cities in France speak French exclusively and expect you to have a good idea about the language. Most companies and universities in fact only accept students and workers if they know the language. There must be only 50 placements out of 1000 jobs per year that don’t expect you to know French. In order to learn the language properly, you need to meet French people, attend classes and revise what you have learnt and listened to French music, radio or watch TV shows. That will be your first step. It may not even be closely related to your job but learning about a country’s history and culture can make your life comfortable and enjoyable in every sense. You would be able to readily mix with the people, have a common topic of discussion, and you will feel less isolated in a foreign country. Only focusing on the work can make you feel desolate and that can be more dangerous than being infected with a disease. So make sure that you learn about their culture and blend in accordingly. When trying for international jobs, if the language you think is an issue, then you must get ready to become more flexible in your approach. Don’t expect that you will get the same well paid high powered job like you did back in your hometown. If you are looking for a job in a country like France, flexibility matters a lot. You need to improve your French at the same time so that you become more eligible for jobs. The qualifications that you own must also match up with the expectations of the job. CVs should be done in French so you need to make sure they are concise. So if you want a senior position, then it shouldn’t be longer than two pages. In case you are hoping for a smaller role, then one page should be more than enough. Also, you must remember that if you put a photo in your CV, it cannot be something over the top. It should look formal and normal. We have seen over the years’, people use photos that look like they are at a party or shaking hands with someone. We really don’t need that. Next, you must remember to search in all the right places. There are a few good American universities in Paris who are waiting to help people like you in need. Magazines always have leads about the latest job vacancies for people from across the world. So you need to look that up. When job sites matter, the monster is one of the best as it has all the details you are probably looking for. You can look up on Google regularly to see which places are offering a job at the moment and which ones aren’t. When you are about to meet business people or French bosses for the first time, remember to show them some respect because that is what they like. It is not at all okay to get too friendly with them since they expect you to treat them like a boss should be. When you have a meeting with them over coffee, you can shake hands with them or maybe say a calming joke. Also, you should also remember to use the term void otherwise it will come across as rude. Learn French grammar properly before attending a meeting. Also before you attend a meeting, you have to do your homework. The French tax system and employment could be a tad bit complicated. Therefore it is quite a decent idea for you to do your homework, especially when there is a difference between CDDS and CDIs. It could also include non-cadres and cadre positions. You should sign on a few agencies and send as many CVs s you can since this will help you. You should never ever forget the basics you have learnt all this while. Make sure to meet more people. There are several jobs that foreigners inside France are offered. If you want them, you will have to be more socialised and speak to everyone. Keep an eye on people including on the ex-pat events whether it is a quiz or just another meetup. This could definitely be a great way to get a good job in France. Making contacts is a great part of all of this, so you need to join more networks, go ahead and grab more drinks and hang out with more people. In case you are following someone who is also travelling to France or you know people who are coming there or maybe you can’t get any transfer from your current boss to a French branch, then you should look for your rival. There will be people who will have a skill set relevant to that sector so that the people will be able to contact the direct competitors. Next, you should remember to be more patient. Getting hold of a job in France is not easy at all. You have to be patient if you really want to land the job of your dreams. Patience is really the key here guys. But you have to keep trying for it. It may not really sound like the best and most important thing but if you want a employment in France, you will have to get the paperwork done from beforehand. Make sure you have a file in your hand which contains the passport, its photocopies, old payslips and what not. You should have all visas, household bills and working papers at the same time. You have to write down your CV in the way we have told you to. That will also help. The following mentioned are few career tips on how to find a good job in France and best employment opportunities. 1. How can you get a work visa for a country like France? If you belong to a country inside the European Union or if you are from Switzerland, you can work in France without having a france work permit at all. In case you are coming over to the country with a family member who has permits of this type, then again you will be able to work without any permit. If you belong to any other country, then you will require authorization after which your permit will be granted. This happens to be a procedure that needs to be followed. An employer has to organize your authorization because of this. Going to a foreign country can be tough if you are alone in the country with no people of your community. You may be competent in french language and might probably make some great friends in France, but having people from your own country gives you a lot of advantages. France is blessed with diverse people, you are likely to find someone who belongs to your community. If not, you can use online tools to find and search people of your community residing in France and forming your own community. In case you are finding it difficult to find a work in France, you can always opt for freelancing which provides you with the opportunity to work in the comfort of your house. In the meanwhile, you can go to France and search for the job at the place. Within that period you can also get to explore the country and its people. Although you may not be having working permit by then, you will have to apply again. Only keep such option in the extreme condition. Better will be to first get a job and use online tools when you are out of work or working on online jobs. France being part of the European union has a shared market with other European markets. Before your job search, you should consider to learn a thing or two about European union market, how is it structured, how it influences France’s market and benefit you can reap while working for France. Knowing ins and outs of such rule that can help you to find jobs in other European countries at higher pays with less workload. If nothing, you can easily roam about within European union with your work permit. So make the best use of that. If you have your own courage, you can build up your own company in France. It has been happening for years and is a popular concept till today. Even though the French have been running their own company economically, you will still have the right to build your own company. By doing that, you can live there for a lifetime without a problem at all. This brings the article to an end. Always remember that regardless of wherever you go, each country has its own set of rules and you need to follow them if you want a job or would like to work with them. if you are going to prepare for a job at European union then you need to keep in mind that French people are much reserved about their own culture language and way of living. They don’t like foreign culture to invade and tarnish their age-old culture that they have so long preserved. If you are an outsider, then you need to learn their culture to stay and work in France. Also, you must know that most of the European countries including France do not like recruiting people outside the European Union as an employee in their country. So you need to be extraordinarily talented to get a job in France. If you are already living in France and have some tips, ideas and suggestions for those who are travelling, do let us know more so that others can also find help. We are sure your ideas will help others too. On that note, good luck and make sure to try all of these tips and best ways to find a job.